It's hot. Really hot. Somewhere around 100. So, I decided to put a spin on an old favorite and make an ice age treasure hunt. 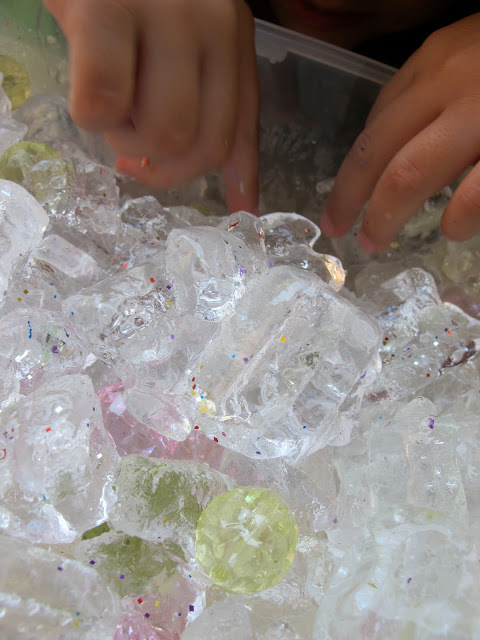 All you need is a bag of ice cubes (or make your own if you plan ahead), and some tiny treasures from around the house. I chose some coins, buttons, and beads. Of course if your items are clear or white it makes the treasure hunt more difficult. Hide the treasures deep under the ice. Then grab a bowl or a tray to to sort the things you find. I gave Holly a tray to sort the treasures and sprinkled some glitter and sequins on top of the ice to act as a treasure decoy! When the ice melted, Holly suggested that we add a little more water, put the treasures back in the water, and let the Barbies go for an icy swim. I thought that would be a great idea, so I added just one drop of blue food coloring to give the water a little more of an ocean look and the mermaid Barbies had a great time. The melted ice water was really chilly and kept us cool outside for about two hours!